Civil and political institutions remain weak and dysfunctional; a well-organized and disciplined military continues to dominate key strategic sectors related to foreign policy and security and currently retains control over the Afghan border region. Recent military operations to clear the northern border regions abutting Afghanistan of terrorist bases have had some success, but the effort inside Pakistan remains unfinished. A well-defined objective and longer-term timetable are needed for the use of the paramilitary Rangers in Punjab and Sindh. Karachi may be the test for these efforts. Governance would be strengthened with better coordination and collaboration between civil institutions and the military. Greater willingness by the military to bring civilians into their military campaign planning processes and to train and assist civil institutions (particularly the police force) in growing into their roles and responsibilities would bolster security. The central government should establish a clearer vision and a process for decision making related to antiterrorism and antimilitancy efforts; devote more resources to its security institutions; and better organize its relationships with individual provinces. Parliament should play a more active role in defining and measuring the success of efforts to counter terrorism and militancy. Civil society must play a more active and informed role in this process. The need for an assessment of the National Internal Security Policy and subsequent National Action Plan of the government of Pakistan became evident as the heightened military action under Operation Zarb-e-Azb entered its second year. This report is based on conversations with civil and military officials and politicians inside Pakistan and on focus group sessions with leading civil and military thinkers, including retired officials, members of the media, and members of the police force. Much remains unclear due to the lack of transparency in operations of both civil and military institutions and the absence of active parliamentary oversight or questioning of operations. A key element of the review was the ability of the military and the civil government to work together effectively at both the federal and provincial levels. As a corollary to this, it was important to see the opportunity for the central government to assert its supremacy. 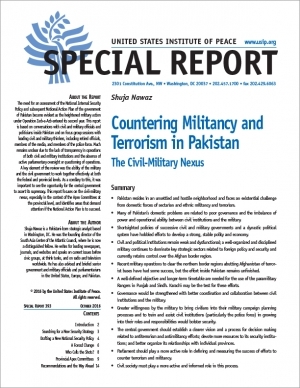 This report focuses on the civil-military nexus, especially in the context of the Apex Committees at the provincial level, and identifies areas that demand attention if the National Action Plan is to succeed. Shuja Nawaz is a Pakistani-born strategic analyst based in Washington, DC. 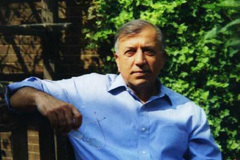 He was the founding director of the South Asia Center of the Atlantic Council, where he is now a distinguished fellow. He writes for leading newspapers, journals, and websites and speaks on current issues before civic groups, at think tanks, and on radio and television worldwide. He has also advised and briefed senior government and military officials and parliamentarians in the United States, Europe, and Pakistan. As President-elect Donald Trump finalizes his cabinet and receives his intelligence briefings, among other things, he will be told about the potential for a nuclear conflagration in South Asia. This populous region with its age-old religious and sectarian rivalries has posed a challenge to US policy makers. Other than a departure plan for an unfinished engagement with Afghanistan, we still do not have a clear or comprehensive regional policy for this volatile yet critical part of the emerging global order. For too long, we have adopted a band-aid approach and single-country policy or at best hyphenated pairs of countries in this region (as in the Af-Pak odd couple). We now have the capacity to craft a broader approach and thus sustain peace and stability in Greater South Asia while opening up larger markets for US goods and services. We need to create relationships that will endure. This demands a regional overview, one that will save the US taxpayers expenditures on fighting wars and US exports and influence in Greater South Asia. An effective regional policy for Greater South Asia has to include more than India, Pakistan, Bangladesh, Sri Lanka and Nepal; Afghanistan and Iran have ancient cultural, economic, and religious ties to the region. Indeed, for example, more Pakhtuns live in what is now Pakistan than do in Afghanistan. And Pakistan has a Shia population that exceeds 40 million, and more Shia live in India and Pakistan than the total population of Iran. When previous US piecemeal policy failed, our government abandoned the region in frustration. For much of the post-World War II period, the US and India were not in the same camp. Today, they are. For the first time in recent history, the United States has developed relations with all the countries of the Greater South Asia region, one that contains around 1.7 billion people and perhaps the largest agglomeration of the Middle Class in the world. South Asia may well be the engine of growth and stability of Asia as a whole in the 21st Century and provide a counter balance to the growth of China. The United States now has an opportunity to help knit together this region to foster trade within South Asia, between South Asia and the Pacific region, and between Central Asia and China. South Asia already has powerful economic ties to the Middle East, providing much of the expatriate labor force that has built up the Gulf States and Arabian Peninsula economies. According to the World Bank, in 2015 more than $116 billion of the total $581.6 billion of remittances from the Middle East flow to geographic South Asia. The slowdown of the Middle Eastern economies following the drop in oil prices will likely have serious consequences for the region. Further, as the Economist Intelligence Unit states “The expected raising of US Federal Reserve policy interest rates from 2017 will also add to downward pressure on the [Indian] rupee and, to a lesser extent, on those of its smaller neighbours.” Creating a regional market, with US help, could help the countries of the region and the United States. India’s huge trade of nearly $100 billion a year with China rivals that with the United States. This economic codependency may help keep these powerful nuclear neighbors from pursuing the path of conflict. Similarly, Pakistan and India have the potential to increase their trade from the current paltry $2.6 billion that favors India to five times that number in the short run, and eventually a high approaching $100 billion a year, helping cement economic ties and shifting the focus away from conflict. The United States needs a game plan to assist in these directions and away from conflict. China is working with Afghanistan, Iran and Pakistan to establish closer trade routes and economic ties. Its One Road, One Belt policy hopes to knit economic ties with Central Asia and other neighboring areas. This fits in nicely with the United States’ New Silk Road initiative, as former Special Representative for Afghanistan and Pakistan Marc Grossman recently argued. And both initiatives could tie the China Pakistan Economic Corridor into trade routes between Afghanistan and Pakistan and Central Asia and the Gulf. The US, with its European partners, should be crafting policies that will assist the creation of a thriving regional economic network in Greater South Asia, based on infrastructure and development of human capital. Helping Afghanistan will be key. Pushing for an extension of the Afghanistan-Pakistan Transit Trade Agreement to India should be among these objectives. This will assist the United States in developing economic and political ties to the people of these countries rather than with status-quo elites or military clients alone. As a start, President Trump should drop the outmoded Af-Pak model. Reviving and revivifying a Central and South Asia Bureau in State and a reorientation of countries in two regional commands, PACOM and CENTCOM, in the Pentagon, to bring all of South Asia into the same orbit would be important changes to consider. This would allow, among other things, for the Indian and Pakistani navies to work together to protect the sea-lanes of the littoral states of the Indian Ocean and the Arabian Sea. Despite the rhetoric of collaboration across the Pentagon’s regional commands, the walls between them are too high and impervious. A big challenge will be to help Pakistan transform itself from what was once termed an “Ally from Hell” to a partner in creating regional growth and stability. Helping Pakistan effectively fight terrorism and militancy inside its own borders, opening up South Asia trade with Afghanistan and Central Asia, and allowing Pakistan to benefit from access to Iranian gas and oil as a first step to linking Iran’s oil pipelines to India’s refineries should be high on the priority list. Further securing its nuclear weapons from radical groups would involve building on the already well-established ties between its nuclear community and that of the United States and the International Atomic Energy Agency. Pakistan also needs help in transforming its anachronistic educational system laden with radical Islamist dogma to an open-minded curriculum. The British government is concentrating on rebuilding the education sector. The US could ride in the British wake. Greater communications and cooperation between India and Pakistan on the nuclear front and on water and glacier management, especially in disaster management planning and control are also areas where the United States’ research and experience can play a key role. If countries in the region are willing to benefit from this enhanced US engagement, economic and financial assistance and advice could then be provided via the International Financial Institutions where the United States has a powerful voice and vote. Afghanistan will need such aid for many years to come. Pakistan has just graduated from an International Monetary Fund program but is not out of the Bretton Woods yet. It relies heavily on World Bank project lending and grants and credits from its subsidized lending programs via the International Development Association. India is not an IMF borrower but still has World Bank and IDA loans and grants on its books. However, it could benefit from advice, as needed, as does Iran. All these are opportunities waiting for a strong and clear-headed policy leadership in Washington. This will involve taking a harder position with countries that demand US assistance so that they take greater ownership of their projects and programs and set attainable benchmarks for success. The US aid program should not be taken for granted or as an entitlement, as was the case with Afghanistan and Pakistan in the past. Further, we need to work more directly and closely with grass roots and civil society groups so we can empower them rather than the often corrupt elites in the capitals of aid recipient countries. And we must forge a partnership that spends aid money in the countries rather than siphon it off back to consultants inside the Beltway or allows aid to be spirited to offshre accounts of ruling elites. Results-based budgeting in this process is a must. This will help us get out of the trap of cash-for-hiring local partners that has characterized our lending and grant making for decades. A clearly enunciated regional policy for South Asia will help remove the doubts surrounding an impending pell mell withdrawal from the region. Afghanistan must not be left in the lurch again, as we did in the 1990s. Engagement is also critical with the other countries of the region. A stable and growing South Asia would not only be good for the region but will also help the United States fulfill its global obligations as a leader and friend of democratic forces and expand the market for our own exports. Delay in addressing the needs of South Asia will add to the list of potential flashpoints around the world and detract from President Trump’s ability to tackle the emerging issues at home. Opportunity is knocking. Shuja Nawaz is Distinguished Fellow at the South Asia Center of the Atlantic Council in Washington DC and author of Crossed Swords: Pakistan, its Army, and the Wars Within, (Oxford 2008) which he is now updating to the current period.